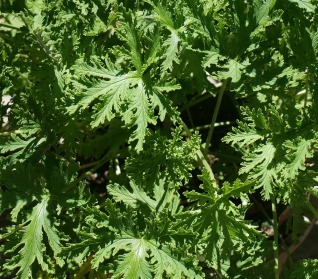 The ‘mosquito plant’ carries the fragrance of citronella in its foliage. When a leaf is crushed and rubbed on the skin, it smells wonderful and helps naturally repel mosquitoes. (The plant itself does not act as a deterrent to the pests.) Though growing mosquito plant is not as effective as using bottled repellents, mosquito plant works gently, and when you grow it in your garden, it is always on hand. Growing upright to 2 to 3 feet in height, they can be used as a summer border or one of several contrasting textures in a garden composition or a large mixed container. Plants respond well to pruning, so don’t be afraid to cut branches for inclusion in summer bouquets, especially if you are dining outdoors. The fragrance will be a welcome addition, blending with more floral scents. If you want to overwinter your plant, propagate a new one during the late summer months by layering. Set a pot filled with potting soil beside your big plant. Bend a stem (still attached to the big plant) gently toward the pot, being careful not to break it. Bury the stem sideways at a point at which a leaf is attached, keeping the growing tip uncovered. Place a rock or piece of brick over the buried stem to hold it in place. After a few weeks, roots will emerge from the stem and grow into the potting soil. At the end of the season (and before frost), cut the stem free from the mother plant and move the new, young plant indoors for the winter.